George Santayana once said "those who cannot remember the past are condemned to repeat it." That may very well prove to be the case if the Republican party nominates Texas Governor and Tea Party icon Rick Perry for President over the establishment Republican candidate and former Massachusetts Governor Mitt Romney. In a political climate where an establishment Republican candidate (or even a well financed Independent candidate for that matter) would be well positioned to deliver the final blow to an embattled Democratic President, the GOP would be foolish to allow the conservative wing of the party to toss out the best chance that it has of securing the victory in 2012. Indeed, to do so would be to fail to divine the lessons learned from the now infamous '64 election between Republican Barry Goldwater and Democrat Lyndon B. Johnson ("LBJ"). Ladies and Gentlemen, I respectfully submit to you that we have seen this movie before and (spoiler alert) it doesn't end well for the ultra-conservative guy. - Barry Goldwater, The Conscience of a Conservative, p. 27 (1960). But Goldwater didn't stop there. As Senator for the conservative state of Arizona (the "Papers Please" state was not much different then than it is today), Goldwater voted against the Civil Rights Act of 1964 and the Voting Rights Act of 1965, the latter of which stopped racially discriminatory practices by states primarily in the South that, prior to the Act, had successfully prevented Blacks and other minorities from voting. 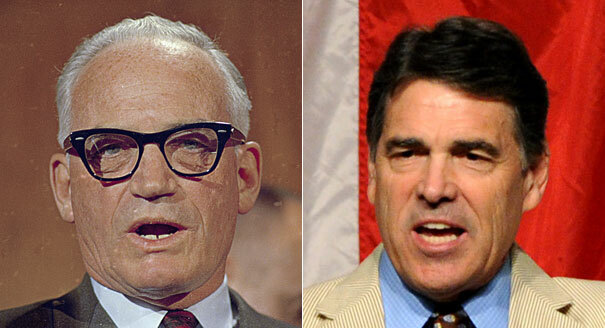 Goldwater, much like Rick Perry, fully embraced the concept of States' Rights, small government, and ending entitlement programs like Social Security. 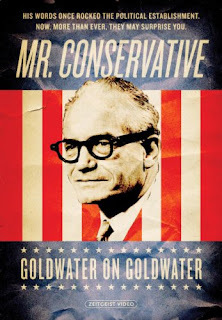 In sum, Goldwater was a Conservative with a capital "C" who was so far to the Right that he scared the crap out of the rest of the country. Interestingly enough, when the '64 race first got underway, Rockefeller (who was Governor of the state of New York at the time) was the clear front-runner within the GOP, but once Goldwater entered the race, the support he gained from the social conservative wing of the party catapulted him in the polls ahead of Rockefeller. Although they recognized that Rockefeller had the best chance of beating Democratic incumbent President LBJ, the Republican party viewed Rockefeller as a "rich guy" governor of a northeastern state who was a bit too moderate for their tastes, especially when you consider that Goldwater was feeding them a fresh supply of red meat daily. Sound familiar to anyone? Today, when the 2012 race first began, it was Romney, the "rich guy" governor of a northeastern state, who long enjoyed front-runner status within the GOP. Indeed, the political consensus continues to be that Romney is the most electable candidate in a match up against Democratic incumbent President Obama. However, once the super conservative Rick Perry arrived on the scene, the Republican polls have consistently shown Perry leading Romney by as many as 15 points as Republicans continue to migrate away from the more moderate Romney in favor of the more red-meat-feeding Perry. To be sure, stylistically Obama and LBJ are nothing alike. Personality wise, you'd probably find more in common between Danny Devito and Arnold Schwarzenegger. 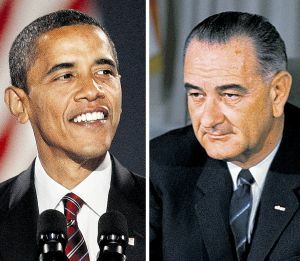 Obama's pragmatic compromise-first-ask-questions-later style of leadership is certainly at odds with LBJ's more aggressive "Johnson Treatment" style. However, the situation that each President found/finds himself in with respect to his political opposition is very similar. Each President was/is seeking re-election during tumultuous times. Prior to his election, LBJ had become extremely unpopular among the social conservatives who viewed his passage of the Civil Rights Act of 1964 as an unconstitutional intrusion by the federal government into matters that were best left to the States or to private individuals to decide. Likewise, Obama faces a similar opposition to his passage of the Patient Protection and Affordable Care Act of 2010, better known as "Obamacare." However, the strongest parallel stems from the circumstances surrounding their political opponents; each was/is facing an opposing party that favors harsh conservative rhetoric over establishment Republican principles. Had Nelson Rockefeller received the Republican nomination in '64, LBJ would have had a difficult time trying to defeat such a popular Governor. Despite America's emotional attachment to the then recently assassinated President John F. Kennedy ("JFK"), LBJ's association as JFK's Vice President may not have been enough to best the fiscally conservative and well financed Rockefeller. Likewise, should Romney win the Republican nomination in 2012, Obama will be hard pressed to convince the American public that a former Governor and fiscal conservative like Romney isn't a safe bet for a struggling economy. But as we all know, that didn't happen. 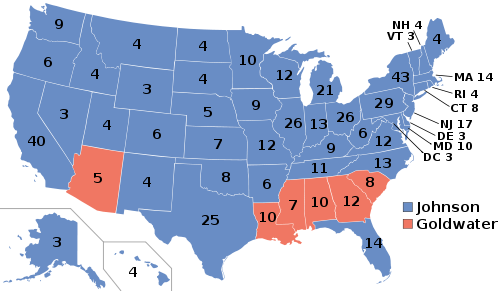 LBJ won a record-setting 61% of the popular vote, destroying Goldwater with 486 electoral votes compared to Goldwater's 52. Now even though the electoral map has, of course, changed slightly since 1964, the fundamentals still remain the same: social conservatives are primarily located in the southern and midwestern states, whereas progressives tend to dominate the coastal and north-central states. Moreover, the American people today, as a whole, are just as Center-Right ideologically as they were in 1964. In other words, most people do not fall within the fringes of either the Left or the Right but instead come down somewhere in the vast middle. Therefore, a candidate like Perry who appeals to the far-Right only has about as much of a chance of getting elected President of the United States today as Barry Goldwater did in '64. Feeding red meat to the masses of Tea Partiers might make for good sound bites on Fox News, but the problem with red meat is that not everybody in America likes their steak served bloody. Based on the current GOP poll numbers, this is a lesson that the Republican Party apparently never bothered to learn.